← stand back – there’s still a pulse! For a poem is not timeless. Certainly it lays claim to infinity, it seeks to reach through time [durch sie hindurch] through it not above and beyond it. For most marketing to work, it has to attach itself to time: it has to be targeted at a particular audience, and released at the perfect moment (or at least that’s the theory). A print advert, for example, is not built to reach through time to someone in the distant future. It’s job is to stimulate people in the here and now. However you do see people enjoying old adverts, say the one below for Guinness. This would never be released now, other than in an ironic way. It no longer sells, but has an art-like quality that manages to reach through time to us still. 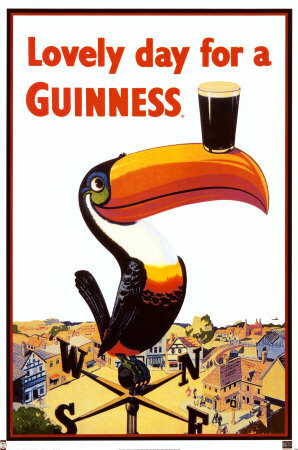 This entry was posted in Uncategorized and tagged Guinness, Paul Celan, toucan. Bookmark the permalink.